The birthstone for March is aquamarine, which comes in light blue to a dark blue color. The name is derived from its seawater color. The deep blue stones are more valued, and it can sometimes be confused with blue topaz. The bluish-green colored stones are most recognized as aquamarine. 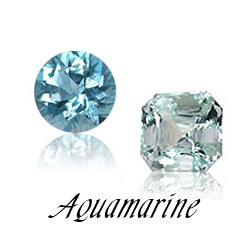 Aquamarine gets it color from iron and is found in coarse-grained granite. The Moh's hardness is a 7.5 - 8; so it's not a delicate stone. Aquamarine is a member of the beryl family along with morganite (pink) and emerald (green). The best source for aquamarines is Brazil, but it can also be found in Australia, India, Kenya, and other countries. The largest specimen of morganite was found in coastal Maine. It is believed to bring the wearer a peaceful sense of calm. I think I need to wear aquamarine more often! 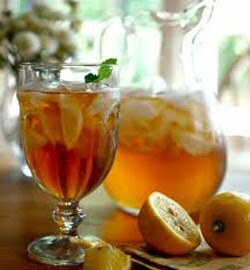 There is nothing more wonderful than a cold glass of Southern sweet tea! Southerners just seem to know how to make iced tea that is absolutely wonderful. Being a southerner, I can say it isn't difficult, but it does have to be done correctly. If you have never had this wonderful tea, give it a try. Bring approximately 2 and 3/4 cups of water just to a boil. Remove from heat and put in 5-6 tea bags to steep with the pot lid on. I use Luzianne tea, but unless you are located in the south, you may not be able to find this brand. Usually a store brand is a good substitute; Nestea® and Lipton® are not good substitutes. Let the tea steep for about 30 minutes or so. The longer it steeps, the darker it becomes. Then take out the tea bags; put them in a spoon and wrap the string around the spoon and bags to "squeeze" out the liquid. Now pour the tea into a pitcher that will hold about 1 1/2 quarts. Pour 1 1/2 - 2 cups of sugar in the hot (this is important) tea and stir. Run the water from your faucet until hot, and slowly fill the pitcher with hot water. Stir the tea while adding the water. The hot water is important as otherwise the sugar will not dissolve and it won't taste right. A 'foam' will develop on top while you are adding the hot water. Just scoop it off with a spoon. Then place the pitcher in the refrigerator to cool the tea. If kept in the refrigerator, the tea will stay good for several days - if you can keep it that long. Add ice to glasses and pour yourself a glass of Southern sweet tea! The best there is.